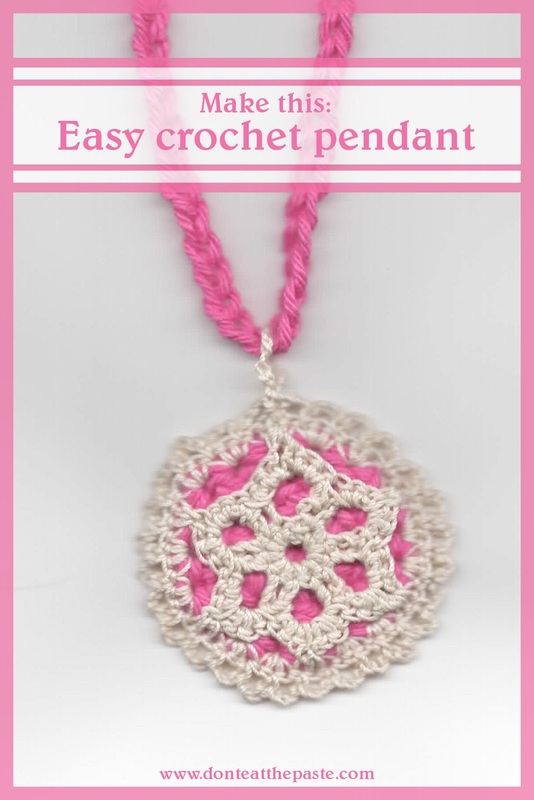 I think I found a new favorite way to doodle with crochet while watching tv with my family, so if you like this crocheted yarn and thread pendant, let me know and I'll post more patterns later. The nice thing is they are quick to make, add a bit of color to an outfit and cost very little- they can be done with scraps of yarn and thread. repeat ** around means to repeat the instructions between the asterisks. Break of yarn, weave in ends. Magic ring or chain 6, join with slip stitch. Rnd 4: Get the yarn circle, and hold it to the back of the of the thread flower. Remove hook from loop on flower, put it through one stitch on the outer rim of the yarn round, pull thread loop through the stitch. Chain 1, sc in st and the ch 3 picot on the flower together, sc in same stitch on the yarn round, 3 sc in next st on the yarn round, 3 in next st on the yarn round, sc in next stitch on the yarn round, sc in same st and the ch 3 picot on the flower together, sc in same st on the yarn round, *sc 3 times in next st on the yarn round, 3 sc in next stitch on the yarn round, sc in same st and the ch 3 picot on the flower together, sc in same st of the yarn round,*, repeat ** 2 times, 3 sc in next st of the yarn round, 3 sc in next st of the yarn round, sc in next st of the yarn round, join with sl st to first sc in round. Rnd 5: Ch 1 (does not count as first st), sc in same st, ch 3, skip next st, *sc in next st, ch 3, skip next st*, repeat ** around. Join final ch 3 with sl st to first sc to join. Chain 10, sl st in same sc to join. Break off thread, weave in ends. Now you just need to make a cord for the necklace. I slip stitched a length for the cord shown, but you can also use monk's cord, a braided length, or even put it on a different kind of cord entirely. In round 5 - should it be *sc in next st, ch 3, SLIP or SKIP next st* around? Good catch! Thank you. Fixed now. Great pattern by the way, thanks for sharing it!